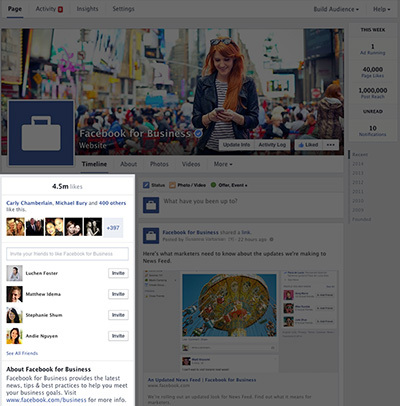 Facebook have done it again and updated your Business Pages layout. It looks as though the custom have now gone but it does like there are some decent admin tools for business owners to play with. Facebook says it will make it easier for people to find the information they want and help Page admins find the tools they use most. The right-side column of your timeline now displays all your Page’s posts. 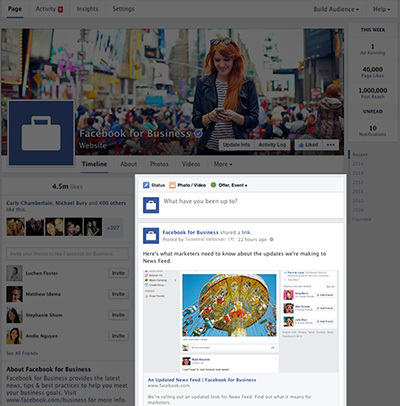 This one-column display means that all of your posts will appear consistently on your Page and in News Feed. No matter where you are on your Page, you can now view information about the ads you’re running and new likes on your Page, as well unread notifications and messages. You can click on any section in the This Week section for more detail. We’ve also added new navigation options to the top of the Page, making it easier to access your activity, insights and settings. The Build Audience menu at the top of the Page offers direct access to your Ads Manager account. As we roll out the new design of Pages, we’re also opening up our new Pages to Watch feature in the Page Insights tool to all admins. Pages to Watch allows admins to create a list of Pages similar to their own and compare the performance of their Page with that of the businesses they care about. 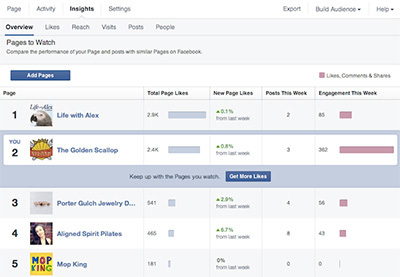 On the “Overview” tab of Page Insights admins will see some key stats about the Pages they are watching. The “Posts” tab of Page Insights includes a feature to view the past week’s most engaging posts from the Pages you’re watching.